LAUNCH OF A MAJOR INITIATIVE FOR PREVENTION OF CHILDHOOD OBESITY & DIABETES AMONG CBSE SCHOOLS IN CHENNAI HELD ON TUESDAY, 11th NOVEMBER, 2008 AT YMCA MADRAS YOUTH CENTRE, CHENNAI ON THE EVE OF WORLD DIABETES DAY. M.V. Hospital for Diabetes & Diabetes Research Centre[WHO collaborating center for research, education and training in Diabetes] launched the "Chennai Slim & Fit" awareness programme for CBSE schools across Chennai. This marked the World Diabetes Day theme "Diabetes in Children and Adolescents" chosen by International Diabetes Federation for this year. The programme drew a large number of school children nearly 800 in number, teachers and parents for a day of awareness building. Some of the key highlights of the event were the variety contests for children like quiz, slogans, poster making and the speech. The winners of the individual contests bagged some amazing cash prizes and the overall top performing schools in the contests were given away trophies. The function was presided over by Dr.S.Elango, Director of Public Health and Preventive Medicine Govt of TamilNadu. He launched the program for schools aimed at spreading awareness and fighting childhood obesity and diabetes along with the release of a "Kit for Detection and Awareness of Childhood Obesity and Diabetes". The first kit was received by Mr. S. Nagaraju, Regional Officer, CBSE Chennai. Photo [above] Dr. S. Elango, Director of Public Health &amp; Preventive Medicine, Government of Tamil Nadu [3rd from left] releasing a kit for detection and awareness of Childhood Obesity &amp; Diabetes for school children and Mr. N. Nagaraju, Regional Officer, CBSE Chennai [2nd from left] receiving the first kit on behalf of the schools. Noted India's Car Racer Mr. Aditya Patel [ extreme left] and noted India's International Basket Ball Player &amp; Asian All Star Mr. S. Robinson Nathan [2nd from right] and Dr.Vijay Viswanathan, Managing Director, M.V.Hospital for Diabetes &amp; Diabetes Research Centre, Royapuram, Chennai [3rd from right] and Mr. V.Gopinathan, Chief Executive Officer, Diabetes Research Centre [extreme right] are also seen. 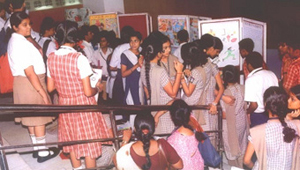 [Photo above] students are posting their posters on the boards as part of the inter school competition on "healthy lifestyle and prevention of obesity and diabetes" held at YMCA Madras Youth Centre, Vepery, Chennai on Tuesday, 11th November, 2008 in connection with World Diabetes Day. [Photo above] students are assembled for a quiz competition session as part of the inter school competition on "healthy lifestyle and prevention of obesity and diabetes" held at YMCA Madras Youth Centre, Vepery, Chennai on Tuesday, 11th November, 2008 in connection with World Diabetes Day. NOVEL INITIATIVE OF M.V.HOSPITAL FOR DIABETES TO PREVENT DIABETES AMONG CHENNAI POLICE PERSONNEL HELD ON SUNDAY, 5th OCTOBER, 2008 AT ROYAPURAM, CHENNAI. [Photo left above] Dr. Vijay Viswanathan, Managing Director, M.V.Hospital for Diabetes talking on the Diabetes Prevention Programme. 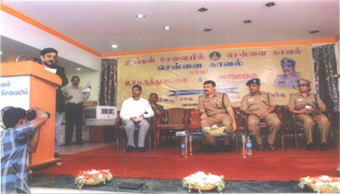 This is a two year programme aimed at preventing diabetes and other metabolic disorders among the Chennai policemen. Thiru. R. Sekar, IPS Commissioner of Police is seated in the middle. Thiru Abhay Kumar Singh, IPS Joint Commissioner of Police (North] is seated 2nd from right. Tmt. Kamini, Deputy Commissioner of Police [North] is seated on the extreme right. 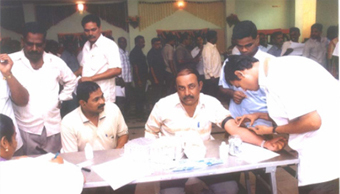 [Photo right above] Chennai police lined up to undergo the blood test to prevent diabetes. 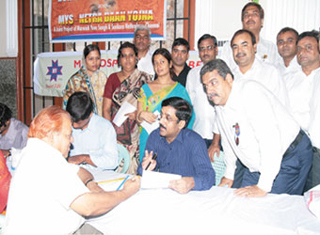 Photo left above] Dr.Vijay Viswanathan, Managing Director, M.V.Hospital for Diabetes, Royapuram [left] and Dr. Riyaz [right] with participants of the medical camp. [Photo right above] Samastha Nair Samajam President Shri. K.R. 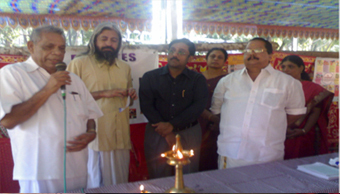 Bhaskaran Pillai inaugurated the medical camp by lighting the traditional lamp. 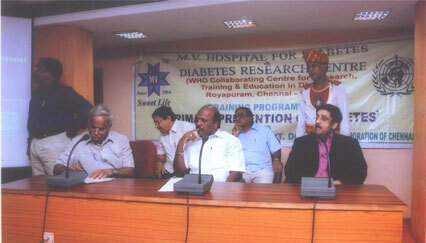 3 DAYS CONCLAVE ON HEALTHY LIFESTYLE HELD AT M.V.CENTRE FOR DIABETES, MYLAPORE, CHENNAI FROM 19-09-08 TO 21-09-08. Ms.Nina Reddy, Director, Savera Hotel Ltd [right] releasing the CD on "Women's Health and Nutrivision" to Ms. Lekha Thomas, Sports Woman, Junior Gold Medalist, Asiad Games [Left]. Dr.Vijay Viswanathan, Managing Director [centre] and Dr. Varsha, Founder Chair, Indian Institute of Nutritional Sciences [extreme right] are seen in the picture. Ms. Lekha Thomas, Sports Woman, Junior Gold Medalist, Asiad Games [Left] releasing the "Diabetes Health Privilege Card of MVH" . Dr.Vijay Viswanathan, Managing Director [centre], Dr. Varsha, Founder Chair, Indian Institute of Nutirional Sciences, [2nd from right] and Ms.Nina Reddy, Director, Savera Hotels Ltd [Extreme right] are seen in the picture. Thiru Abhay Kumar Singh, I.P.S., Joint Commissioner of Police Chennai North, who was the Chief Guest, presented Prof. M. Viswanathan Gold Medal for the best outgoing student of the FDRC [Residential Fellowship Programme in Diabetology] course to Dr. M. Deepa. Mr. S.Vee Shekher, MLA Mylapore and famous theatre artist on the left and Dr.Vijay Viswanathan, Managing Director, M.V.Hospital for Diabetes, Royapuram, on the right are in the picture. Diabetes detection and awareness camp for Marwadi community held at Sowcarpet on Sunday, 10th August, 2008 by the Institute and the Marwadi Association in connection with 51st birthday of their spiritual leader Acharya Srimad Vijay Nityanand Suriswarji Maharaj Saheb. 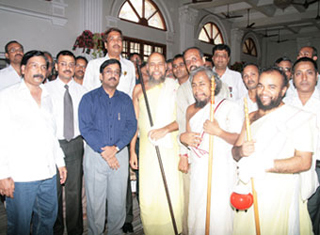 Photo [left] Spiritual leader of Jain Community Acharya Srimad Vijay Nityanand Suriswarjji Maharaj Saheb (third from right) and Dr.Vijay Viswanathan (fourth from right) are seen in the picture. 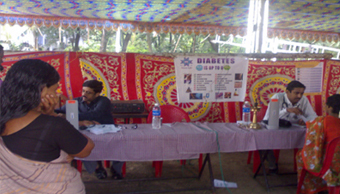 Photo[right] Dr.Vijay Viswanathan[centre] giving medical advice to a participant in the diabetes detection camp. 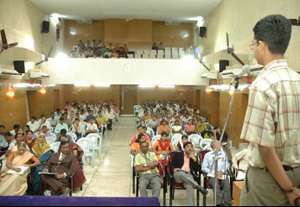 LAUNCH OF TRAINING PROGRAMME ON 'PRIMARY PREVENTION OF DIABETES' TO DOCTORS OF CORPORATION OF CHENNAI ON TUESDAY, 22nd JULY, 2008 AT JUBILEE HALL, CORPORATION OF CHENNAI. Seated middle is Mr. M. Subramaniam, Mayor of Chennai Corporation and on the right is Dr.Vijay Viswanathan, Managing Director, M.V.Hospital for Diabetes and Diabetes Research Centre, Royapuram and on the left is Dr. K. Karunanithi, Chief Project Officer, Diabetes Research Centre are seen in the picture. LAUNCH OF ONLINE DIABETIC FOOT CARE PROGRAMME AND INTERACTIVE SESSION ON 'DIABETIC FOOT CARE' ORGANIZED BY M.V.HOSPITAL FOR DIABETES, ROYAPURAM AND DIABETIC FOOT SOCIETY OF INDIA AT RANI SEETHAI HALL ON THURSDAY, 17th JULY, 2008. Dr. T.P.Kalaniti, M.D., Director of Medical Education, Govt. of Tamil Nadu [right] launching the "online Diabetic Foot Care programme". Dr. Vijay Viswanathan, Managing Director, M.V. 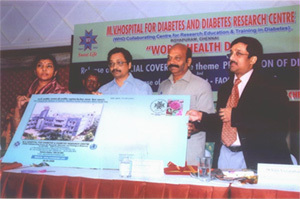 Hospital for Diabetes and Diabetes Research Centre, Royapuram [Left] looks on. While Dr.Ali Foster [Internationally known Podiatrist from London] takes a glimpse of the newly released book "Tips on Foot Care for people with Diabetes". Chairman CA Rajendra Kumar SIRC of ICAI is addressing the students, CAs & the medical team for Diabetes detection and awareness from M.V.Hospital for Diabetes, Royapuram at ICAI Bhavan, Nungambakkam on Tuesday 1st July, 2008 in connection with their Diamond Jubilee Celebrations. Sitting left on the dias is Vice-Chairman of the Institute CA M. Devaraja Reddy and right on the dias is Dr.Vijay Viswanathan, Managing Director, M.V.Hospital for Diabetes, Royapuram, Chennai. LAUNCH OF TRAINING PROGRAMME ON "PRIMARTY PREVENTION OF DIABETES" TO TAMIL NADU GOVT. DOCTORS, VILLIPURAM DISTRICT AT VILLUPURAM ON FRIDAY 20th JUNE, 2008. STANDING SECOND AND THIRD FROM RIGHT – DEPUTY DIRECTORS OF PUBLIC HEALTH, VILLUPURAM DISTRICT DISTRIBUTING BOOKLETS AND POSTERS ON 'PRIMARY PREVENTION OF DIABETES TO PARTICIPATING DOCTORS. STANDING SECOND FROM LEFT : DR. K. KARUNANITHI, CHIEF PROJECT OFFICER, M.V.HOSPITAL FOR DIABETES AND DIABETES RESEARCH CENTRE, ROYAPURAM. FREE DIABETES DETECTION CAMPFOR ERNAKULAM PRESS CLUB JOURNALISTS CONDUCTED BY THE INSTITUTE ON TUESDAY, 17thJUNE, 2008. 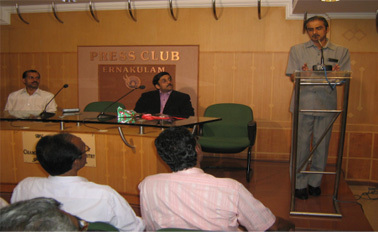 Mr. K.Padmanabhan Nair, Retd.Justice of the Kerala High Court addressing the audience after releasing a FAQ book on diabetes at the Ernakulam Press Club on 17-06-2008. Sitting [right] Dr.Vijay Viswanathan, Managing Director, M.V.Hospital for Diabetes, Royapuram, Chennai and Ernakulam Press Club Secretary Mr. P.N.Venugopal [left] are in the picture. The Vellore Collector, Thiru Dharmendra Pratap Yadav, IAS speaking at the launch of Training Programme on Primary Prevention of Diabetes to Tamil Nadu Govt Doctors at Vellore Collectorate on Tuesday, 20th May,2008. Sitting second from the right is Dr.Vijay Viswanathan, Managing Director, M.V.Hospital for Diabetes & Diabetes Research Centre (WHO Collaborating centre for research, education & training in Diabetes), Royapuram. 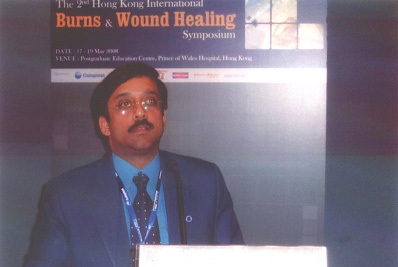 Dr. Vijay Viswanathan, Managing Director, M.V.Hospital for Diabetes & Diabetes Research Centre (WHO collaborating centre for research, education & training in Diabetes) speaking at the event of 2nd Hong Kong International Burns & Wound Healing Symposium. 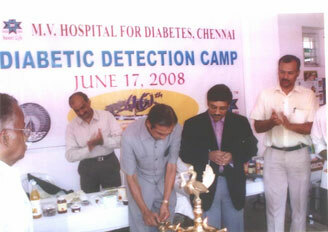 A DIABETES DETECTION CAMP FOR THE RESIDENTS OF "THE BANYAN" HELD ON SATURDAY, 3rd MAY, 2008 AT MOGAPPAIR. 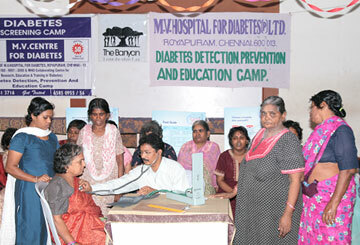 A free diabetes detection camp for residents of 'The Banyan', Mogappair, an organization that helps rehabilitate destitute and mentally ill women, was conducted by the M.V.Hospital for Diabetes and Diabetes Research Centre (WHO collaborating centre for research, education & training in diabetes), Royapuram, Chennai. Over 250 residents participated in the camp. RELEASE OF SPECIAL COVER ON TEN GOLDEN RULES FOR 'PREVENTION OF DIABETES' HELD ON SUNDAY, 6th APRIL, 2008 AT HOTEL SAVERA CHENNAI. In the photo above, Tmt. Indira Krishna Kumar, I.P.S., Principal Chief Postmaster General, Tamil Nadu Circle (left) releasing the Special Cover on Ten Golden Rules for 'Prevention of Diabetes' and Thiru V.K.Subburaj, I.A.S., Health Secretary, Govt. of Tamil Nadu (second from left) receiving the Special Cover. Dr. P.Padmanabhan, Director of Public Health, Govt. of Tamil Nadu and Dr. Vijay Viswanathan, Managing Director, M.V.Hospital for Diabetes & Diabetes Research Centre, Royapuram, Chennai are seen in the picture. 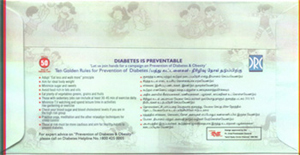 Extract of the Special Cover on 'Ten Golden Rules for Prevention of Diabetes' both in English and Tamil released by Tmt. Indira Krishna Kumar, Principal Chief Postmaster General, Tamil Nadu Circle at a function held at Hotel Savera on 6th April, 2008. 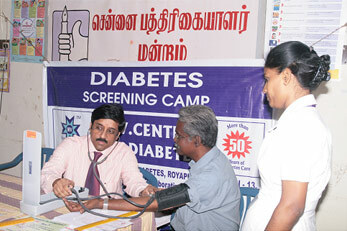 Madurai Medical Camp held on 30th March, 2008. M.V.Hospital for Diabetes & Diabetes Research Centre (WHO collaborating centre for research, education & training in diabetes) has conducted a medical camp in association with Sansar Consulting Group at P.T. Rajan Hall, Madurai on Sunday, 30th March, 2008. More than 150 people were screened for diabetes. A lecture on “Prevention of Diabetes” was delivered and leaflets on the subject were given to the participants. Apart from the above, blood pressure recording, height, weight, & waist measurement and random blood sugar testing were carried out. 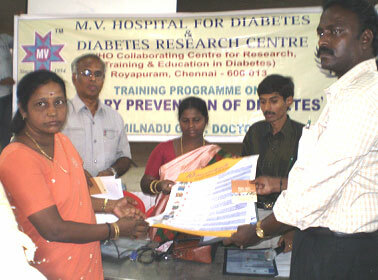 An Awareness programme on Diabetes & Obesity for Journalists held at Chennai Press Club on Saturday 22ndMarch, 2008. In the photo above, a journalist is being examined by Dr. Vijay Viswanathan, Managing Director, M.V.Hospital for Diabetes and Diabetes Research Centre, Royapuram & M.V. Centre for Mylapore. 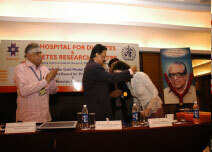 An awareness programme on Diabetes was held for Journalists at the Chennai Press Club on Saturday, 22nd March, 2008. 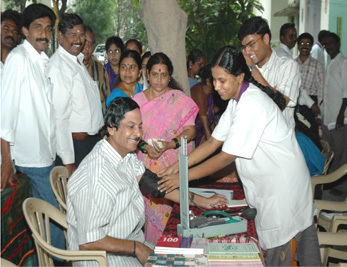 Mr. N. Kannaiah, General Secretary, SRMU gets his BP recorded at a Diabetes detection camp organized by M.V.Hospital for Diabetes and Diabetes Research Centre, Royapuram for Railway employees at Ayanavaram, Chennai on 16-02-2008. Indian subcontinent is experiencing an alarming rise in the prevalence of diabetes. 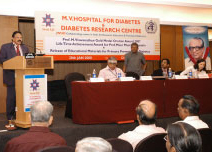 To address this issue, Indian Medical Association in collaboration with M.V.Hospital for Diabetes, Royapuram, Chennai has launched a one year distance education programme for the general practitioners at IMA (TNSB) State Council meeting held at Tambaram, Chennai, India on 10-02-2008. The curriculum consists of contact classes and one week of hands on experience to give practical exposure and train the doctors to manage diabetes and its complications effectively. 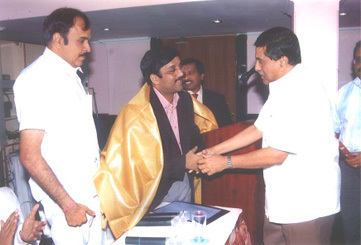 In the picture above, Dr.Vijay Viswanthan, Managing Director, M.V.Hospital for Diabetes & Diabetes Research Centre, Royapuram being felicitated by Dr. Ashraf from Trichy at the launch of one year Fellowship Certification in Diabetology Course. 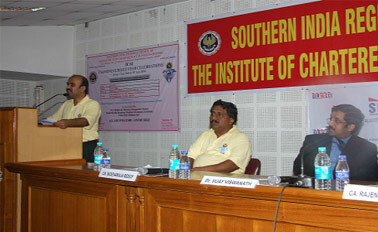 It was held at Indian Medical Association, Tamil Nadu State Branch office at Tambaram, Chennai on 10-02-2008. Dr. A. Muruganathan, Dean, IMA CGP is on the right. Prof.M.Viswanathan gold medal oration award 2007 was held at Taj Connemara on 20-1-2008. 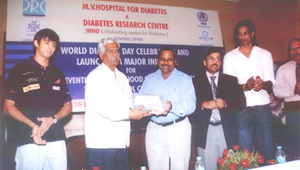 Dr. Gojka Roglic, Responsible Officer, WHO Diabetes Programme, Geneva has been conferred with the award. The event was witnessed honouring Prof. Dr. K. Meer Mustafa Hussain, Vice-Chancellor, Dr. M.G.R. Medical University the Life Time Achievement award along with a citation apart from unveiling a campaign on "Primary Prevention of Diabetes". Deputy Director General (Medical), Directorate General of Health Services Mr. P.H.Ananthanarayanan and Managing Director of M.V.Hospital for Diabetes, Dr.Vijay Viswanathan spoke. 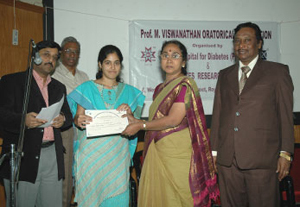 Winners of the Prof. M.Viswanathan oratorical contest on primary prevention of Diabetes held on 11-1-2008 at Madras Medical College were presented with prizes. Prof. Dr. K. Meer Mustafa Hussain Vice Chancellor, Dr. MGR Medical University speaking at a function Prof.M.Viswanathan gold medaloration award 2007 held at Taj Connemara on 20-01-2008. Prof. Dr. K. Meer Mustafa Hussain, Vice Chancellor presenting Prof.M.Viswanathan gold medal to Dr. Gojka Roglic, Officer WHO Diabetes Programme, Geneva held at Taj Connemara on 20-1-2008. 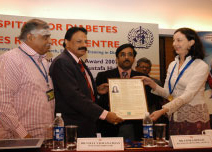 Dr. Gojka Roglic, Officer WHO Diabetes Programme Geneva receiving the prestigious Prof.M.Viswanathan gold medal oration award 2007 citation from Prof. Dr. K. Meer Mustafa Hussain, Vice-Chancellor, Dr.MGR Medical University held at Taj Connemara on 20-1-2008. Prof. M.Viswanathan oratorical competition was held on 11-1-2008 at Madras Medical College Seminar Hall. Around 20 students studying at city's Government Medical Colleges including MMC, Stanley Medical College, Nursing college and Government Siddha Medical College participated in the event. 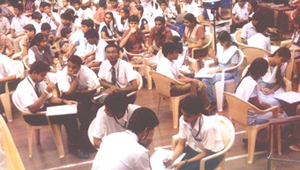 Undergraduate students from the third to the final year were invited to participate. Manjula Dutta, former Professor of Dr. M.G.R. Medical University and one of the judges at the contest, provided tips to the participating students. 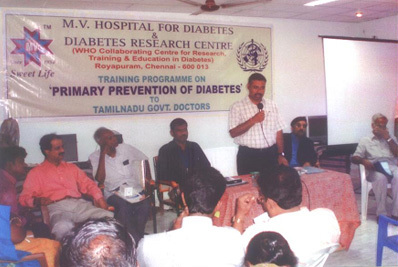 A medical student is speaking on "Primary Prevention of Diabetes in India at the event "Prof M.Viswanathan oratorical competition held on 11-1-2008 at Madras Medical College Seminar Hall. Ms. Ipshita Kak, a medical student receiving the certificate from Prof. Dr. Geethalakshmi, Vice-Principal, Madras Medical college at the event Prof. M. Viswanathan oratorical competition held at MMC on 11-1-2008. She has been selected the first winner in this contest. 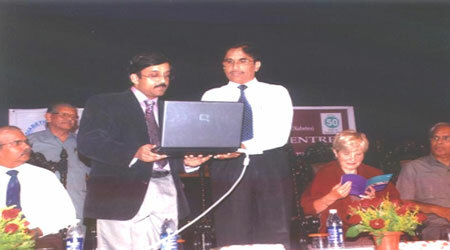 Dr.Vijay Viswanathan, Managing Director, M.V.Hospital for Diabetes (left) and Dr.S.K.Rajan (right), one of the judges, are seen in the picture.